This is part of the majestic BBC Wildlife series (we recently reviewed Tiger in the same series). This time we are lucky enough to get up close and personal with the most powerful bird on the planet, the eagle. Taking a comprehensive look at these birds, we follow the habits, hunting, breeding and general lifestyle of a number of different breeds from all corners of the globe, including Australia. What really amazed me during this all too short doco (50 minutes) was the great variety of places eagles nested and what they would hunt for food. Imagine if you will an eagle taking down a kangaroo for food, the power of these creatures is simply amazing. As with Tiger, Eagle is narrated by David Attenborough who gives us a brief appearance at the start of the feature and then does the voice over throughout. The audio on this presentation is stunning being mixed in Dolby 2.0. Visually this is must watch viewing as well with the exception of a couple of little faults that really do nothing to hurt the viewing of Eagle. If we were really to complain about anything it would be that Eagle only runs for 50 minutes and is so engrossing you will wish there was more. 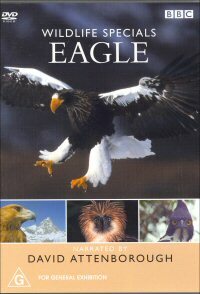 Recommended for anyone interested in a indepth look at this great species of bird. Riveting stuff.